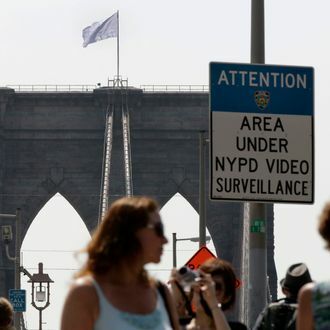 “Many of the city’s best and brightest investigators” — including detectives from homicide, counterterrorism, intelligence, transit, and four different precincts — have yet to crack the case of the crew who strung two bleached American flags atop the Brooklyn Bridge. While the stunt does not appear to have been terror-related, it could have been, so the NYPD is taking the breach pretty seriously. Which just makes it more sad that they haven’t caught anybody yet, considering the leads they do have point to some punk kids, not Ocean’s 11–style masterminds. Here’s what they know so far: The lights went out at 3:29 a.m. on Tuesday after they were covered with some aluminum lasagna pans. Security footage showed a group of four or five guys in the “late teens or early 20s,” one with a skateboard, nearby around that time, the Daily News reported. Those are the prime suspects. And according to the New York Post, a bit of DNA was left on the zip ties used to secure the light-blocking pans, the most promising clue yet. Investigators are also scouring social media, pulling phone logs and running hundreds of license plates, police sources said. They are tracking down all calls made from the bridge around the time the flags were replaced early Tuesday. They obtained the online handles of at least two of the suspects and are going through computers records for their proper names, the sources said. The whole thing sounds more like an elaborate senior prank — although one executed almost perfectly — than a genius heist, and yet here we are. A private Brooklyn resident is reportedly offering a $5,000 reward for the apprehension of any suspects. Most of what’s going on here seems a tad excessive.